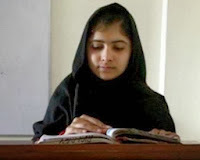 Excellent article about Malala from the Huffington post. As the parents of young girls and people who believe that girls can change the world, today we're celebrating International Day of the Girl and the power of girls everywhere. 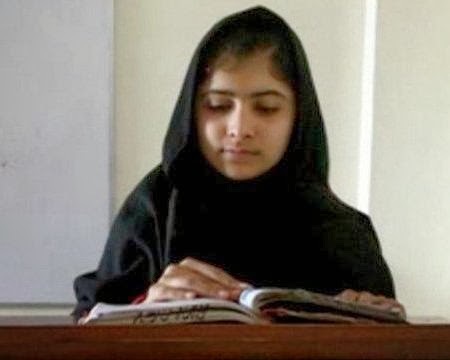 One girl in the news right now embodies this strength: Malala Yousafzai. She's only 16, but Malala is many things: a champion for girls' right to education, a survivor, an inspiration, an older sister, and a role model. There are more than 600 million adolescent girls living in the world today who are bright, talented, and full of dreams, but many are unable to reach their full potential because of discrimination and hardship. One year ago, Malala nearly lost her life for her dream: simply wanting to go to school. In October 2012, Malala was targeted by extremists for her outspoken opinions in support of girls' education in Pakistan. She was gravely wounded, but by no means held back. She has continued her fight and shined a global light on the issue of girls' rights. She inspires us, will be an inspiration for our daughters, and is helping mobilize the world to put girls at the top of the agenda. We had the chance to learn a lot from Malala at last month's Social Good Summit. When asked about her hopes and dreams for the future, Malala declared that she wants to provide an education for every child. She said, "We need to speak up for them. We need to stand up for them, and we should do it now. We should not wait for someone else, we should not wait for the governments to do it, and we should do it by [ourselves]. It is our duty." Worldwide, more than 125 million children are not in school, and more than half of them are girls. At the summit, Malala's father, Ziauddin Yousafzai, discussed this sobering reality, saying that from the day they are born, girls' "wings" are clipped in many communities in the world. Unlike many girls, Malala has a loving father who nurtured her success from the beginning. "I accepted her as [a] free individual. The only thing I tried to make of her was to be free and independent. And I dream for her all that is good. It's up to her what she chooses for herself." As Malala continues her journey, we will continue to do everything we can to help the United Nations and partners open the doors of education to all children - girls and boys. Malala sees education as more than literacy, but the tool to empower girls - allowing them to make their own decisions, pursue their dreams, and become agents of change in their communities. So do we. We stand with Malala, and with girls like her everywhere, today and every single day.